I know. I’m two days late. But we were in California for my nephew’s wedding on the 15th (it was a lovely event, of course), and I have to play catch up to join Carol at May Dreams Gardens for a review of what is blooming in my garden. The week we were absent saw my garden explode with new color and new blossoms. It seems like the whole neighborhood is blossoming. I have already seen forsythia in full bloom, Bradford Pears covered with white, several cherries turning pink, and new red buds on various maples (none of mine yet). 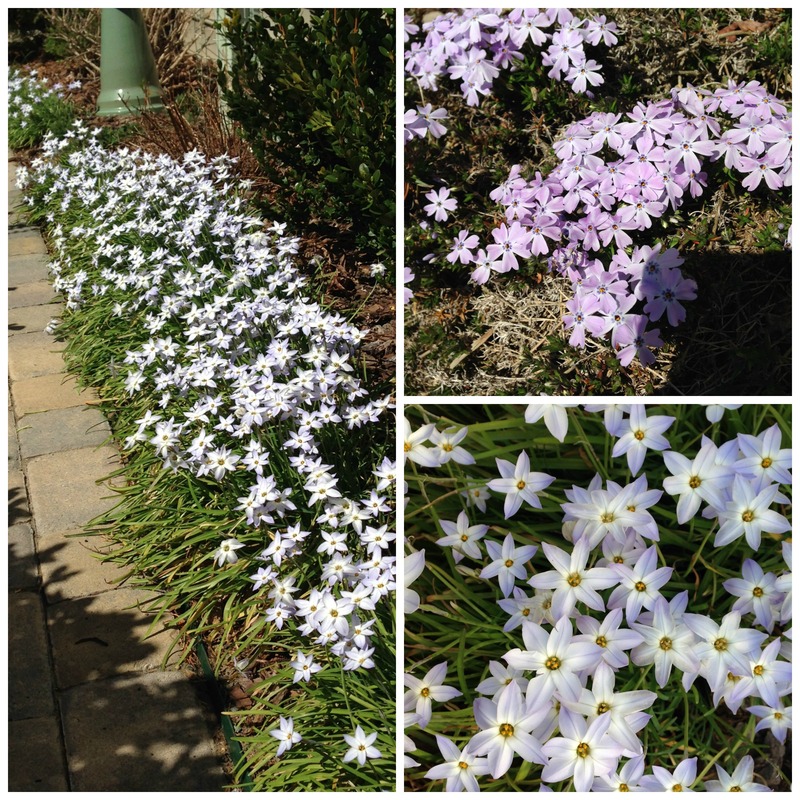 In my garden low ground covers are full of blooms: (left and bottom right) Ipheion uniflorum ‘Wisley Blue’, (upper right) creeping phlox (Phlox sublata ‘Emerald Blue’). Ipheion may be the number one bulb for multiplication that I have ever grown. One tiny bulb becomes dozens in just a few years…ready for replanting and ready for sharing. ‘Tete-a-Tete’ daffodils have fully opened in a week, and the the pansies have come back strong after suffering through the freezing weather. 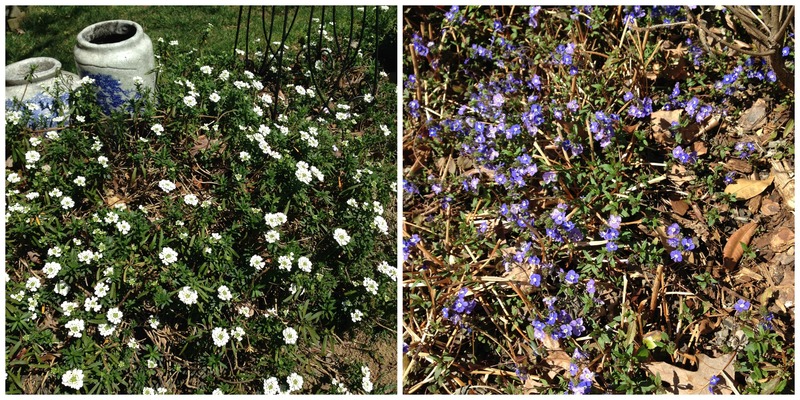 The candytuft (Iberis sempervirens) and the creeping ‘Georgia Blue’ veronica (Veronica peducularis) are looking particularly full this year. My hellebores (top) are better this year than they have ever been in the past. The ‘Red Mill’ Pieris japonica and the rosemary (bottom) are just beginning to open. When we drove home from the airport, it was like we had landed in another city. Certainly this couldn’t be the Charlotte we left just a week ago. 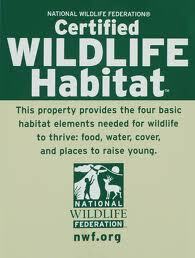 But, yes, it is, and I could not be happier with the changes I see right here in my own back yard. I do hope Carol will forgive this late entry. I am delighted to share it. This entry was posted in Gardening, GBBD and tagged Bradford Pears, candytuft, creeping phlox, Georgia Blue veronica, hellebores, Ipheion uniflorum 'Wisley Blue', pansies, Phlox sublata, Pieris japonica Red Mill, rosemary, Tete-a-Tete daffodil. Bookmark the permalink. 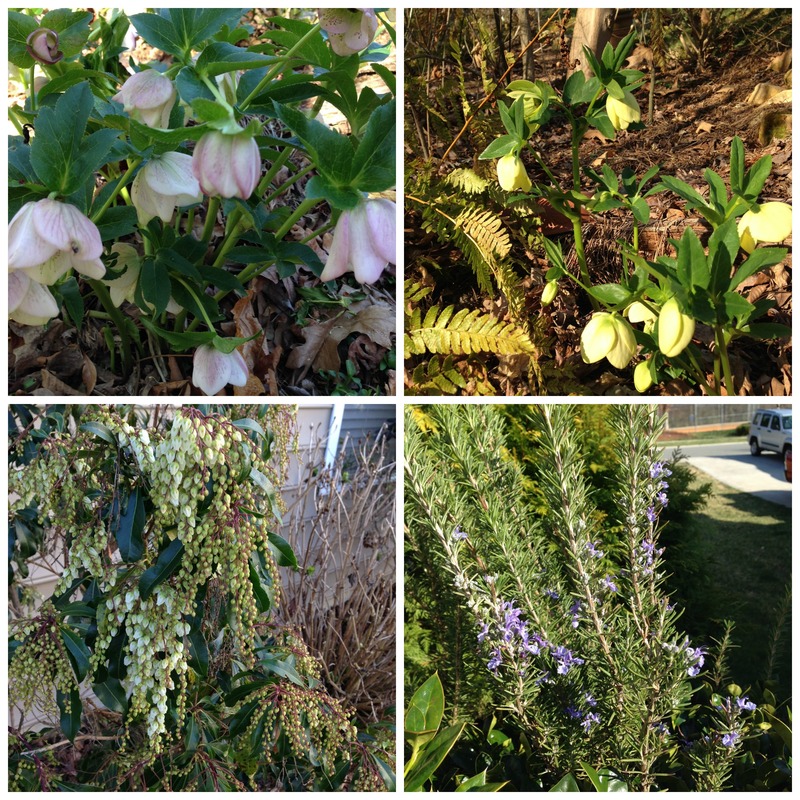 Thank you for sharing – a delight to see your flowers making such good progress! I think I will have to try growing Ipheion as it looks lovely en masse as well as in a vase. Thanks, Cathy. I have found that Ipheion very quickly makes a mass…it spreads so quickly. It always surprises me how much can change in a garden in just a week, especially in spring! Your ground covers look stunning, just what is needed to lift the spirits after winter. You are so right, Christina. I get a whole new psyche when spring arrives. The weather has turned on a dime and everything is blooming at once! The ‘Wisley Blue’ is spectacular. I have very little Ipheion this year, a vole must have gotten it. Glad to hear you had a good trip. Thanks, Marion. You will be pleased to know that I checked the asarum in the woods and can see the beginnings of the little brown jugs. Your garden is really waking up and everything is so lovely. I am smitten with you Ipheion edging. Thank you, Susie. Ipheion has become one of the spring wonders for me. Hello John, your yard is looking wonderful! I’m in the California desert, and it warms my heart to see that the cold parts of the country are coming back to life after such a nasty winter for ya’ll. I’ve never heard of Ipheion before, but I love the shade of blue and will have to check to see if it gets cold enough here for it in Bakersfield. This is my first visit to your site, and my first month of Bloom Day (and I was later than you). Happy Spring! Thank you, Victoria. Glad you found me. 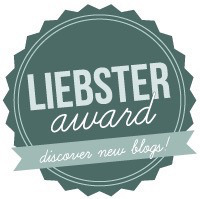 I hope the little bulb will work for you…it’s a winner.